Welcome to my new series which is full of Fitness Fun! My goal is to share my fitness journey, throwing in some health tips and general fitness fun on a monthly basis. After the Christmas holidays January began with getting back into a gym routine. It’s been cold out and so for me the best way to exercise is to stay indoors! As I mentioned in my tips to make the gym fun I have been really getting back into doing classes. I used to pretty much only do classes but the last few years I have done lots more on my own in the actual gym. I love classes – They are so motivating and generally they are 45 minutes to an hour of intense exercise. I have been enjoying 3 classes this month – spinning, circuits and Body Attack. Spinning is all done on a stationary bike, I am a little picky about a good spinning class as I dislike lots of standing up and doing press ups on the bike! Circuits is a great all-over body workout with cardio, weights and body weight exercises all mixed in, you do each exercise for a minute and then move onto the next. Finally Body Attack is just intense, check out this video to see what’s it all about. I love it! Alongside doing these classes I have also been listening to my body. Over Christmas I had a cold and then I had another one last week so I’ve been making sure I take rest when I need it. I’ve learnt from the past, overdoing it can set you back even further. I have added a little bit of yoga to my morning routine this month. I am so inflexible and decided 2015 is the year to work on it. I’ve been following Erin Motz’s 30 Day Yoga Challenge on YouTube. It’s great because everyday is different – Some days I can do the exercises and somedays (most days) I struggle. I have noticed a big difference when I have missed a day so this is something I will certainly keep up with. Each day is only 10-20 minutes so it’s easy to add in. I would love to give a yoga class ago at some point but for now I am happy doing it on my own in the privacy of my front room! To go with all my working out I have invested in some new gym clothes, especially sports bras! 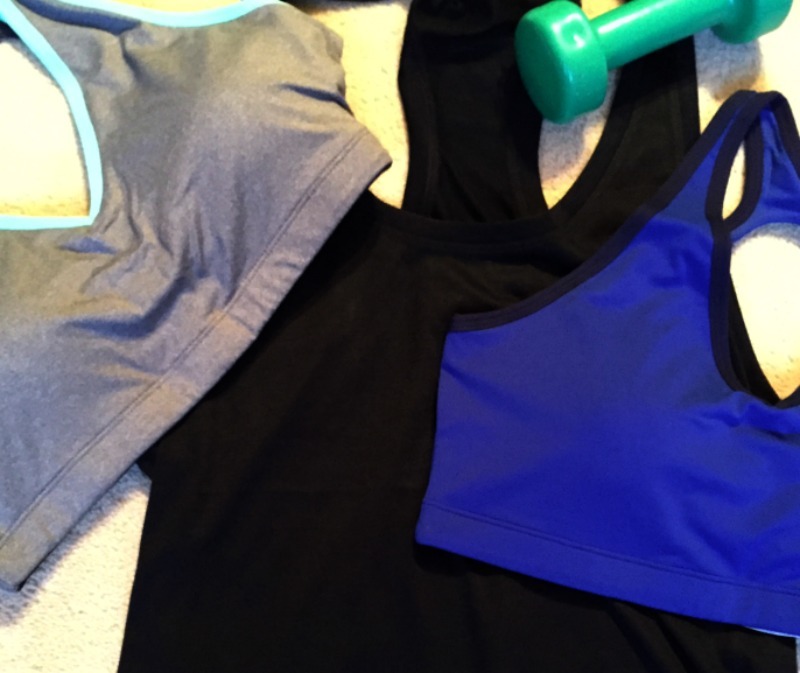 I love the Fabletics Koia Sports Bra so much I just had 2 more delivered today – Of course, I also added in a new top too. I have quite a few Fabletics outfits now and I really like them all! Finally I have really been focusing on eating healthier. I didn’t partake in the fashionable dry January but also haven’t had too much alcohol this month (just a few cheeky glasses of wine on a couple of occasions). I have also focused on tracking my calories on MyFitnessPal just to see what amount works best for me to help with weightloss. I found a couple of weeks I didn’t eat enough and so didn’t lose any weight. This is a work in progress so watch this space! So that’s the first instalment of this regular Fitness Fun series. What have you added into your fitness this January? Share below!